Enjoy hours on end of treasure hunting with the Treasure Cove 1015 junior metal detector! Get your kids outdoors! 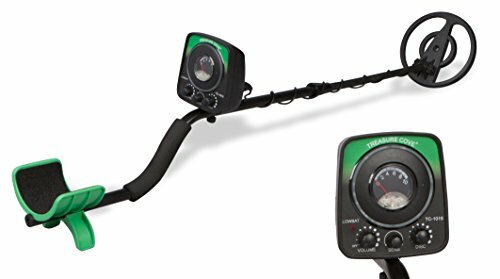 This state-of-the-art metal detector from Treasure Cove is packed with features that can easily assist budding hunters to find hidden treasure buried in the ground. Using the discrimination mode tells the operator the metal composition of an object. This saves you the effort and the frustration, of digging for something only to find out it's not what you're looking for. Using the TC-1015 Fast Action Junior Metal Detector is hassle-free, thanks to its self-tuning feature. Simply turn it on and you're good to go. Go treasure hunting even in shallow water with the TC-1015. Its 7.5 inch waterproof search coil can even be submerged in water if needed, allowing for almost unlimited treasure hunting options even in muddy conditions. Weighing in at only 2.0 lbs, and measuring in at 30-40 inches long (adjustable length), the TC-1015 is a portable and compact metal detector for children and young adults. It's ideal for young and new treasure hunters. It allows for hours on end of treasure hunting at the park, local beach, woods, ruins, deserts and fields without the extra weight. Treasure Cove is so confident in the quality of our metal detectors that we offer an industry leading 10-year warranty on the TC-1015 Junior metal detector. Use your product with confidence knowing that your purchase is protected. WATERPROOF SEARCH COIL: The Treasure Cove TC-1015 Fast Action Junior metal detector can easily detect a U.S. up to 7 inches and larger items up to even greater depths. GREAT FOR BEGINNERS: The Treasure Cove TC-1015 FAST ACTION JUNIOR was specifically created for budding treasure hunters (Ages 10 and older), or for weekend warriors. As a junior metal detector, the TC-1015 can be used by anyone from 10 years old and above. Its two-color LED viewmeter has indicators for both ferrous (iron, steel) and non-ferrous metals (gold, silver, nickel). It also has simple discrimination that tells you the metal composition of an object beneath the ground. 10 YEAR WARRANTY: As a testament to our dedication to quality, the Treasure Cove TC-1015 FAST ACTION JUNIOR metal detector comes with an industry-leading 10-year warranty. Use your product with confidence know that your purchase is protected. If you have any questions about this product by Treasure Cove, contact us by completing and submitting the form below. If you are looking for a specif part number, please include it with your message.